It is finally summer in the city. We are more than halfway through July, just survived our first major heat wave and have another one on the horizon. Blink and it will be August. If you have not started checking off items on your summer to do list now is the time. There is an endless list of options to get you outdoors, especially in the evening as temperatures cool down. Every borough has multiple free movie screenings covering most days of the week. You can watch a movie on the beach in Coney Island on Monday, a comedy on the East River at Solar 1 on Tuesday, hit McCarren Park on Wednesday, Tompkins Square Park on Thursday and River Flicks on Pier 54 on Friday. That just scratches the surface. Summer concerts abound. I have seen Ray LaMontagne as a part of Celebrate Brooklyn at the Prospect Park Bandshell and Indigo Girls at Summer Stage in Central Park. I am seeing Ryan Adams at Summer Stage tonight and plan on seeing Alpha Blondy in Marcus Garvey Park in August, also a part of Summer Stage. Summer is fleeting. Make a plan and get outside. Here are a few suggestions of things to try before we hit Labor Day. Shakespeare in The Park is a long tradition in New York City. Unfortunately, unless you are willing to get up at 5am or hire the homeless to wait on line it is a challenge to get tickets to a show at the Delacourte Theater in Central Park. Fear not, for the Classical Theater of Harlem is putting on a vibrant production of Macbeth at Marcus Garvey Park in Harlem through July 31. This ninety minute production features dance, music, a few choice topical references and strong performances. The performances are free and take place in the renovated Richard Rodgers Amphitheater, with plentiful bench seating and great sight lines. It is a night out that is perfect for the family and Red Rooster is only a few blocks away. This is my new summer Shakespeare tradition. 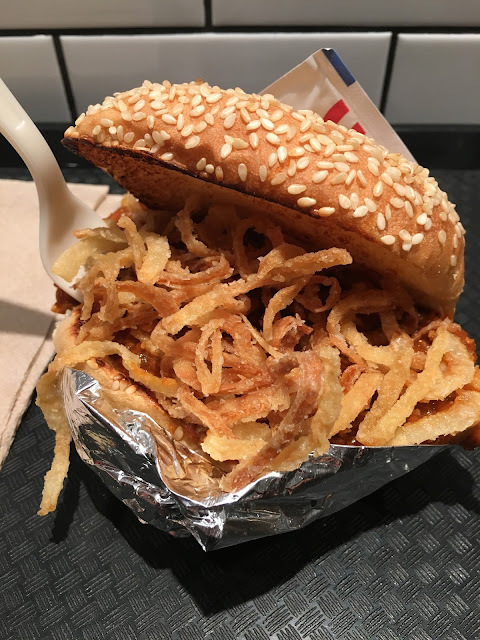 The Sloppy Dave, a Sloppy Joe with a twist and fried onion upgrade. Superiority Burger opened in a small space on east 9th Street with much hype & early praise. This vegetarian and accidentally vegan restaurant has the feel of an old school burger take out joint and features a vegetarian burger on the menu. A night out with a vegetarian friend inspired a visit. I did not have much interest in the burger but the Sloppy Dave piqued my interest. For those of a certain generation the mention of a Sloppy Joe brings back very specific memories, especially of school lunch. Most modern versions miss the mark, either too sweet, not enough bite or forgoing the requisite ground beef texture. I was curious how close the Sloppy Dave, a tofu version, could even come. Simply stated, it hit the bullseye. The Sloppy Dave is a little smaller than the Sloppy Joe's of memory but is comes on a soft, seeded hamburger bun, toasted & perfect. The texture is close to ground beef but the key is the sauce, which is the perfect balance of lightly sweet, ketchupy flavor and a solid, spicy bite. It drips out of the bun and onto your hand, as it should, and features a very welcome upgrade, frizzled onions, crispy fried onions that split the difference between onion rings and the canned fried onions my mom used to use to dress up numerous dishes. All thoughts of tofu go out the window as the joy of a Sloppy Joe from the memory banks washes over you. It has been a week since I had the Sloppy Dave and the highest praise I can give it is that it has joined the ranks of things that I crave, and unlike the memories of dishes from my youth, this is one craving I can satisfy. ChikaLicious has been on the sweet tooth radar for some time. I have written about it in the past. There are two locations across the street from each other on East 10th Street. The Dessert Bar is a formal sit down dessert bar featuring a Prix Fixe and wine parings. Its sibling across the street is the Dessert Club, the informal take out dessert spot featuring ice cream and pastries. ChikaLicious made its name a few years ago when it had the brilliant idea to use an empty eclair shell as a cone for their excellent soft serve. They have raised the game with the coneCHURRO, a hollowed out churro used as a cone. To be honest, the coneCHURRO is not really a churro. What is really is is some of the best, flakiest pie crust somehow made into a cone with the outside coated in the fried cinnamon of a churro. So, yeah, it is still fantastic. 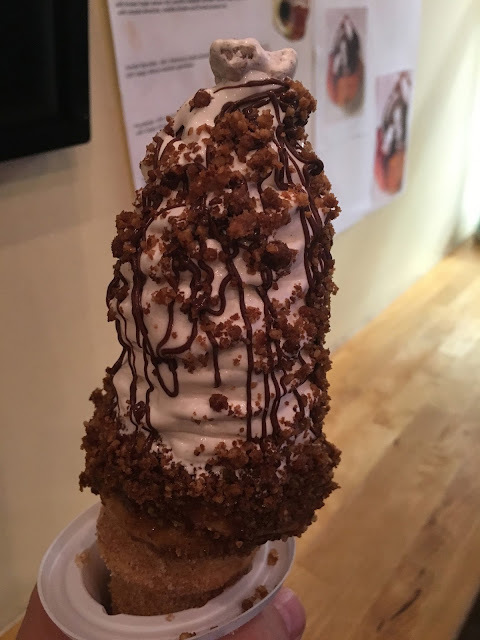 Nutella smeared inner cone, brown sugar pecan rim, Vanilla Bean soft serve, toasted almonds, Nutella drizzle and frosted pecan top. Imagine a the Good Humor Toasted Almond ice cream bar x10 and you have an idea how good it is. There are about five more coneChurros I am dying to try. Thank goodness it is ice cream season. Regardless of where you live of or what you like to do, summer in New York has something for you, from a churro filled with ice cream to a creative staging of Shakespeare in one of New York's many parks. Find something that appeals and get outside. I had planned on a continuous stream of posting about my trip to Portland but a recent discovery has forced me to alter my best laid plans. I will return to Portland, but keeping with the theme of great coffee I felt compelled to share. The weather has finally broken here in New York and so my rambles have become more frequent and longer. On a recent stroll through the streets of NYC I stumbled upon a small storefront with the words COFFEE PROJECT NY across the top. It triggered a vague recollection of possibly reading about it. Regardless, I investigated. 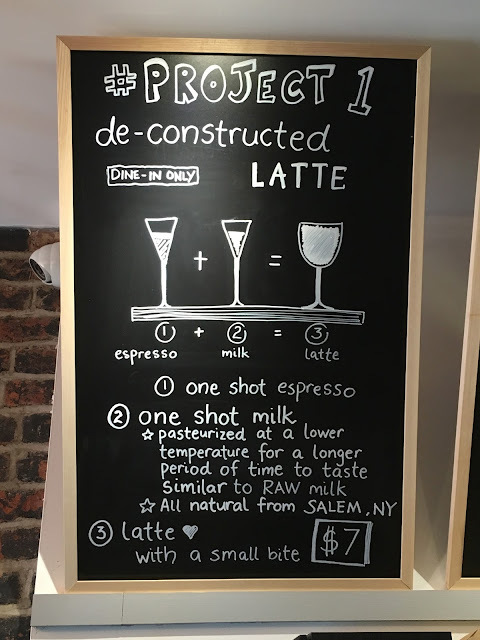 I quickly realized I had read about the shop because of its signature offering, Project #1, the de-constructed Latte. More on that in a minute. 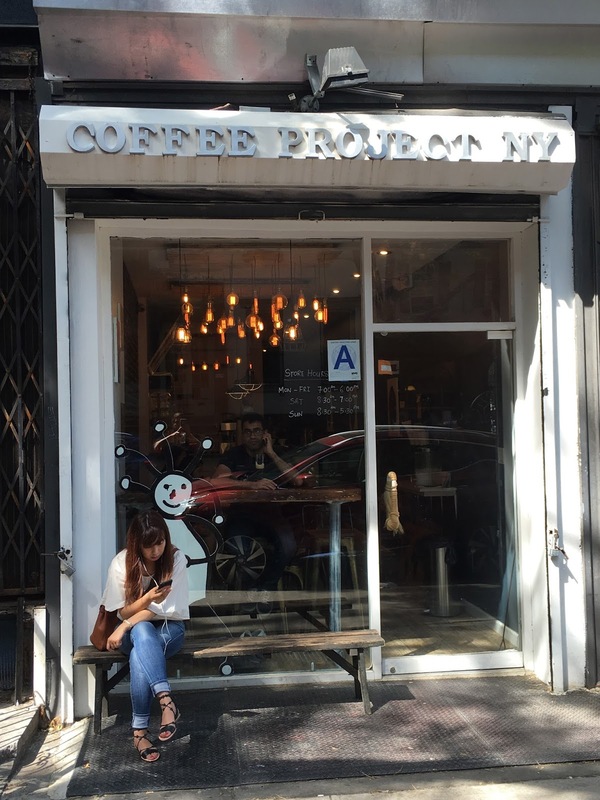 Coffee Project New York is the labor of love of Chi Sum Ngai and her partner Kaleena Teoh. Chi Sum trained as a barista in Portland (aha!) and moved to New York. Coffee Project NY is in the mold of the great coffee shops I found in Portland, run by passionate people with a deep appreciation for great coffee looking to serve a neighborhood and community. Chi Sum and Kaleena welcome you with a hello and a smile the second you enter the shop, doing everything possible to make you feel welcome. Coffee Project NY's beans are roasted for them in Red Hook and their milk comes from Salem, NY. They offer drip, all the expected espresso beverages, cold brew, chai & hot chocolate. They step it up from there. They offer nitro-coffee; cold brew run through a keg infused with nitrogen. I have had nitro-coffee at other places but none has come close to the one at Coffee Project NY. They have their beans for the nitro-coffee specifically roasted to enhance their sweetness. This works well with the nitrogen process which gives the brew a creamy texture without adding any dairy. I am light & sweet coffee guy so it means something when I tell you I did not add a drop of milk or single crystal of sugar to my nitro-coffee. The coffee is bright, with a light sweetness and thick, smooth texture. The closest comparison I can give you is a pint of Guinness poured in Dublin by a pro. The special of the house is Project # 1, the de-constructed Latte. 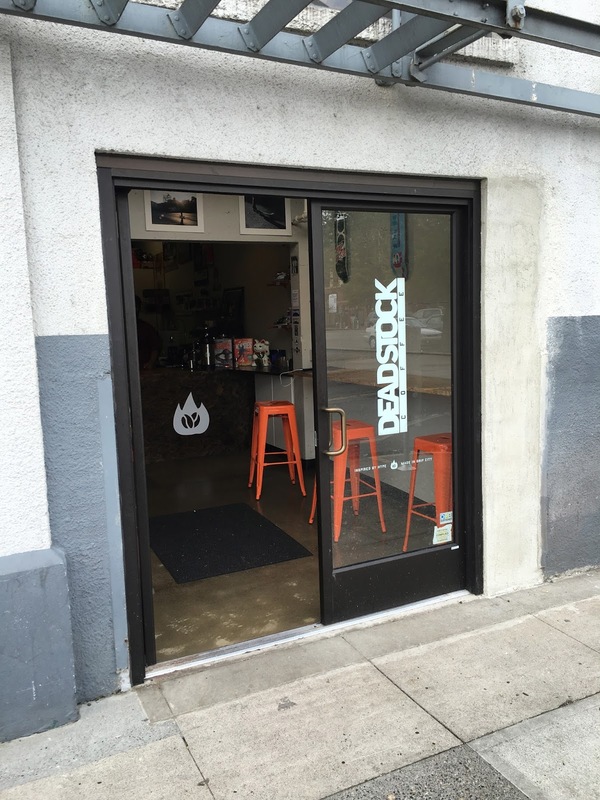 Inspired by Slate Coffee Roaster's version in Seattle it is the impetus behind the shop. 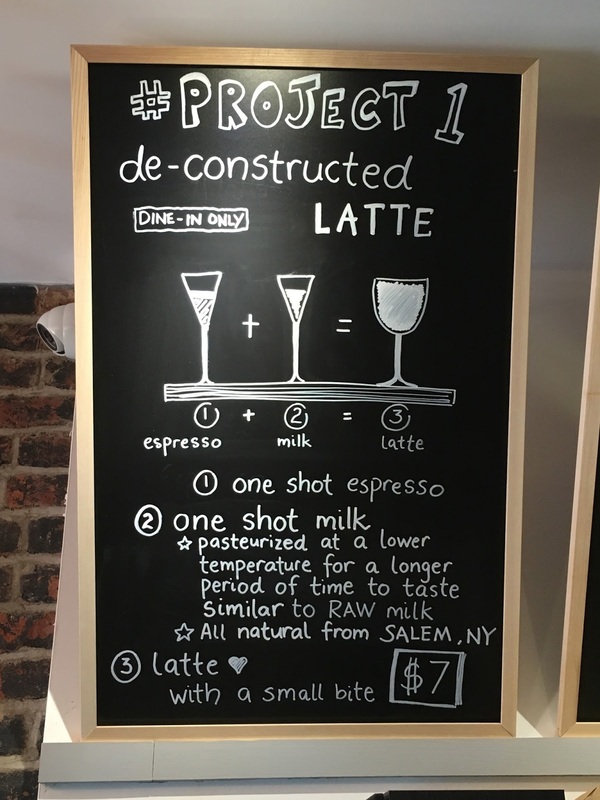 The de-constructed Latte is, in order, a shot of espresso, a shot of milk and a Latte. It is served on a board with a small glass of sparkling water and a sweet biscuit. The milk is specially pasteurized at a lower temperature for a longer period to retain a taste similar to raw milk. It is consumed in the order listed to highlight and enhance the flavors and experience of the Latte. The theory is that by tasting the espresso on its own as well as the milk you are better are able to focus in on all of the distinct flavors when they are combined in the Latte. It works, and it is a delightful experience. The de-constructed Latte is only served in house which makes it the perfect excuse to stop for a moment in this hectic city, focus on something pleasant and truly enjoy the experience. I cannot recommend it enough. All this would be reason enough to visit Coffee Project NY but they do not stop there. 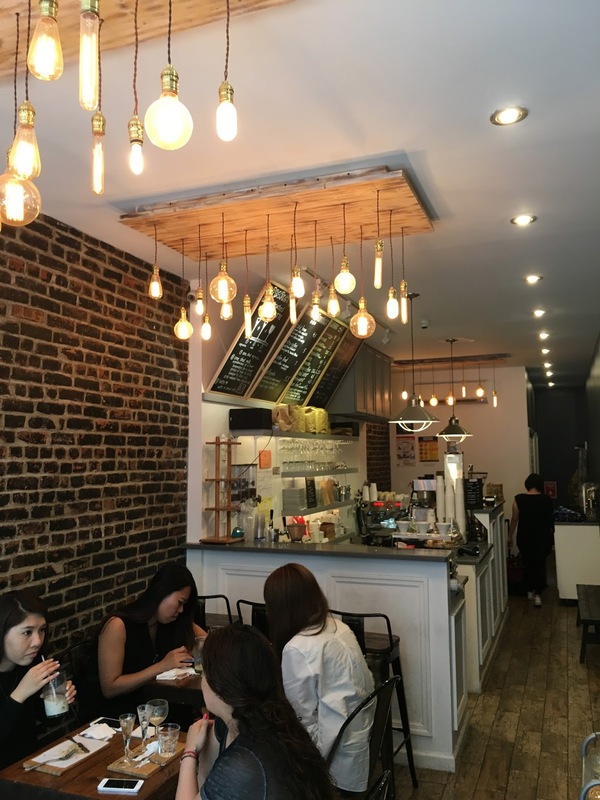 They also offer both and affogato (espresso with vanilla ice cream, one of my favorite things in the world) and a coffee-float (nitro-coffee & vanilla ice cream) Throw in some daily pastries and Coffee Project NY has all the bases covered. Coffee Project NY is a solid twenty block walk from my home, making it a two mile round trip. It is not only worth every step but an inspiration to lace up and hit the pavement. Get ready to stretch your legs. The payoff is worth it. 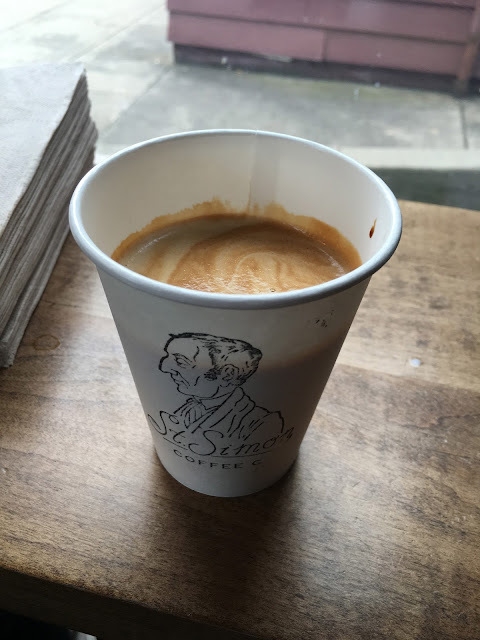 Portland is filled with coffee obsessives and it can seem like every one of them has opened a coffee shop, which is a good thing. The number of coffee shops with just one or two locations is significant and it is even more amazing how many of them are roasting their own beans. Here are just a few of the great shops I visited during my brief visit. All are worth seeking out. Extracto Coffee Roasters has two locations, both in the Northeast. They have, hands down, my favorite logo, a clamp & coffee bean. The shop on NE Prescott is in the same complex as Pok Pok Noi, Muscadine, a bakery and pot dispensary. The shop has a turntable spinning vinyl, a pour over station and antique containers for sugar and other condiments. 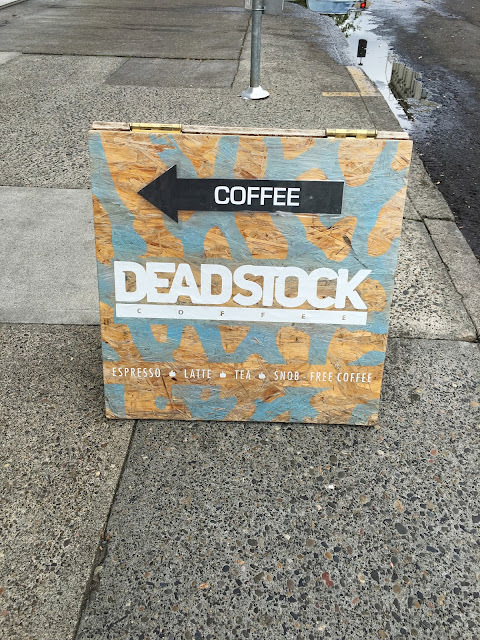 The second shop and roaster are on NE Killingsworth. They have a full line of beans which are available in their shops. Their cortado is a winner, made from their house roasted Eleven of Spades blend. I picked up a bag and brought it home. 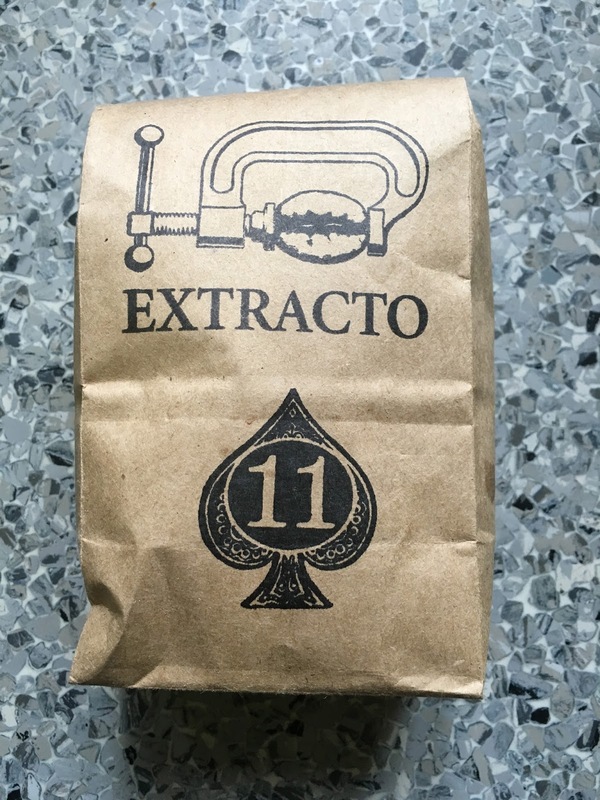 It was great as espresso and equally as good used with a Chemex. Photo taken in my kitchen, because I brought these beans back home. Saint Simon Coffee Company consists of a single shop on NE Broadway. I discovered it when I searched for coffee near where I was staying. The reviews were stellar. They use Coava beans and some reviewers felt they brewed Coava beans better than Coava did in their own shops. High praise. The shop is small and feels a bit like Miike Snow album art come to life. The cortado is fantastic, living up to the reviews. They have a few pastries in the morning and my two younger reviews gave their hot chocolate high marks. Small and singular, Saint Simon is worth seeking out. 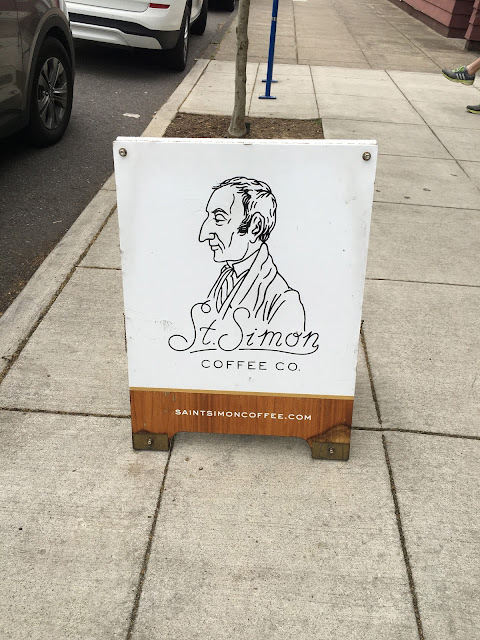 St. Simon cortado. Another hand stamped cup. The number one tourist destination in Portland is probably Powell's Books, and with good reason. The world's largest bookstore, an independent one to boot, is at the heart of this city and a reflection of it as well. It is just as popular with locals. That means when you go to Portland you will go to Powell's. And after hours browsing and wandering the endless aisles you will need coffee. 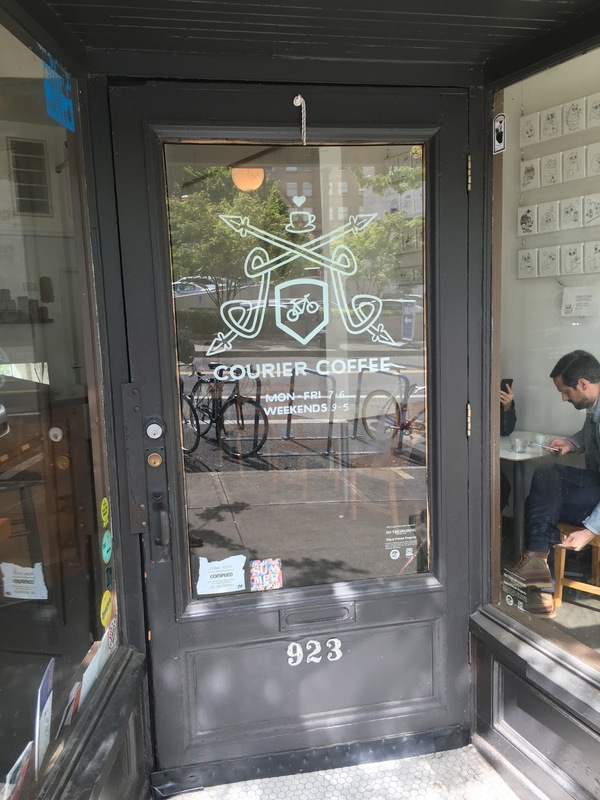 Powell's has a perfectly nice coffee shop in it (of course) but just down the street sits a small jewel that I would urge you to visit instead, Courier Coffee. This tiny store front, which has an energetic mix of DIY and Punk spirit, belies the ambition behind it. The store feels like a bootstrap operation, a turntable spinning tunes and coffee being made. But they are making great coffee, from their owns line of beans. There is roasting going on somewhere. The cortado is spot on. They also have an enticing bit of pastries and sweets. Not just chocolate chip cookies but one of the better canelés outside of France. These happen to come from their own ovens. There are a lot of great things coming out of this small space. After coming from Powell's it may seem even smaller, but it is the perfect antidote for Powell's exhaustion and worth the half a block walk. 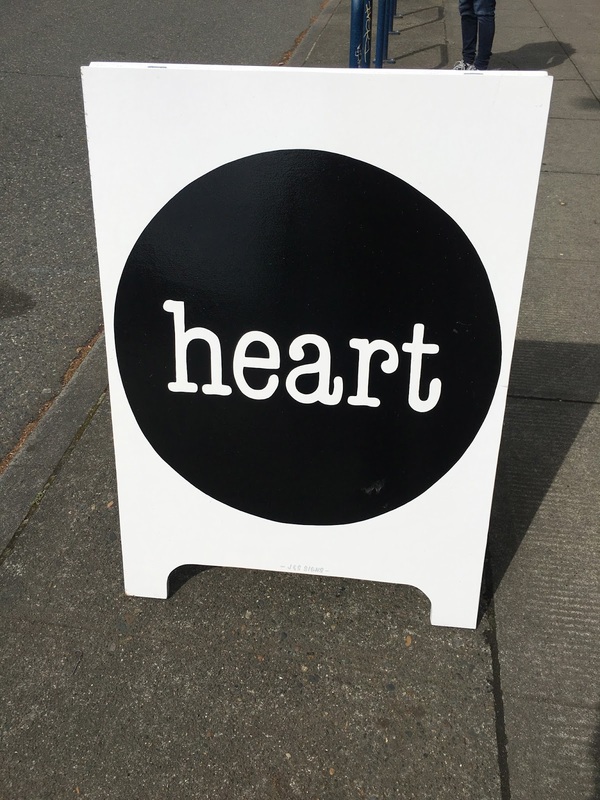 Heart Coffee Roasters is a well know, well regarded roasting company with two coffee shops, one on the East side on Burnside and one on the West side on SW 12th Avenue. Sharp, clean, minimalist modern design runs through the shops, merchandise and website. They sell beans, coffee subscriptions, coffee making equipment and merchandise (yes, they have a beanie) through their website and stores. It is what you would expect from a well run mini coffee empire. 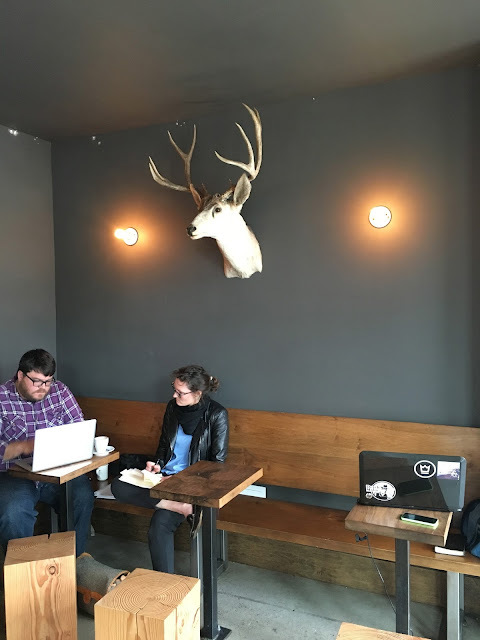 The shop on E Burnside is large and spacious with high ceilings and ample seating. Large garage doors line the wall on Burnside. The cafe offers the usual coffee and espresso drinks as well as V60 and Aeropress. They sell their full compliment of beans in handsome packaging. White dominates the design throughout Heart with black as the main contrast and splashes of color as accent. Heart's compliment of beans. The big bag on the left with the black label is their Stereo Blend. The cortado and all espresso drinks are made with their Stereo Seasonal Blend. It is a lovely, well balanced blend and they pull it well. I did not buy a bag of the Stereo and I am kicking myself. I will be ordering some. I could say something groan worthy but I wont. 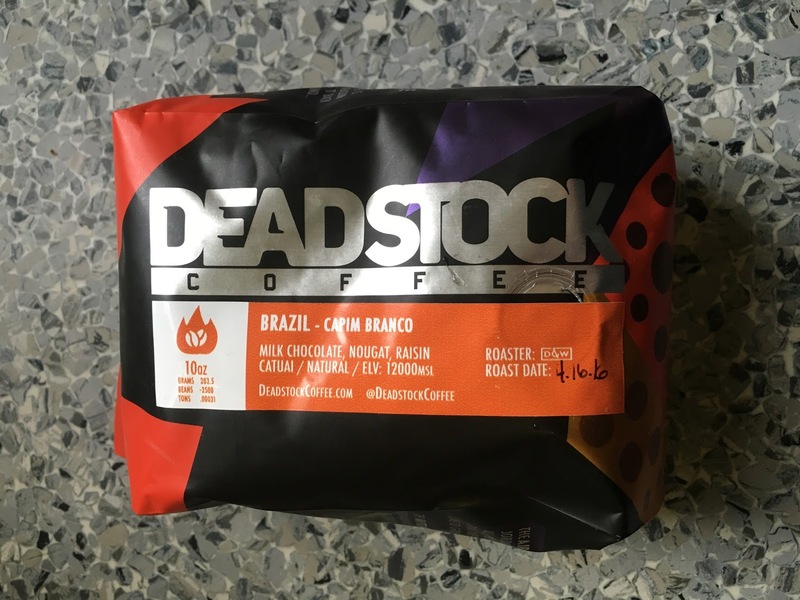 If you have any lingering doubts about Heart Coffee this will put them to rest. As befits a coffee company who's signature espresso blend is called Stereo, this 1970's beauty is the beating heart of the Burnside location, The Marantz 2270 Steriophonic Receiver. Some things were better in the 70s. 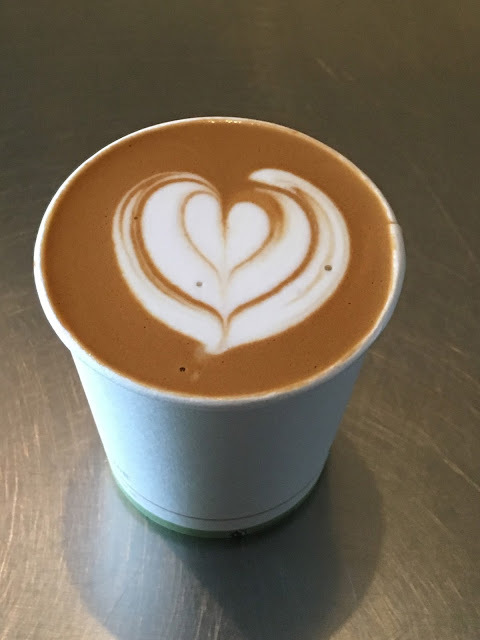 Heart Coffee has a well deserved reputation and a loyal following. Fans of good design as well as good coffee would do well to seek them out. Plus you get to stare longingly at that source of the steriophonic sound. This is just a small small sampling of the diverse and dedicated coffee scene in Portland. It is a small city with an outsize influence on the coffee culture in this country and Nirvana for the caffeine addict. It has been twenty years or so since I was last in Portland (Oregon, not Maine). Based on all I have read about the food and drinks scene in Portland, the fact that it has been central to the Third Wave of coffee in the US and, of course, Portlandia, I was expecting big changes to the city. What I found was a city with the great coffee you would expect, really good food, good drinks and a lot more room to grow. I'm sure if I was a native I would be decrying how overrun the place is. From a New Yorker's perspective, they are just getting started. The running joke as we drove all around Portland and its environs was "Damn, this traffic is killing me." In five days we spent a total of twenty minutes crawling in traffic. Oh the horror. There are moments when you feel you are in a Portlandia skit. There are moments when you could be in Williamsburg or San Francisco. Over all you are in a small, livable city with nice people, lush green surroundings and a lot of good things to eat and drink. And oh, the coffee. That is where we start. You would have to spend a month in Portland to try all the great little coffee spots. I only scratched the surface. My list is neither complete nor a claim to the best coffee in Portland. It is simply the places I visited and what I enjoyed, and I enjoyed all the places I visited. You would have to try really hard to have a bad cup of coffee in Portland. I didn't. Up first, Deadstock. Deadstock Coffee was the first place I discovered. Of all the great coffee spots I found it was probably my favorite. The main reason is the specific theme of the shop and how thoroughly it reflects the personality and taste of its owner. 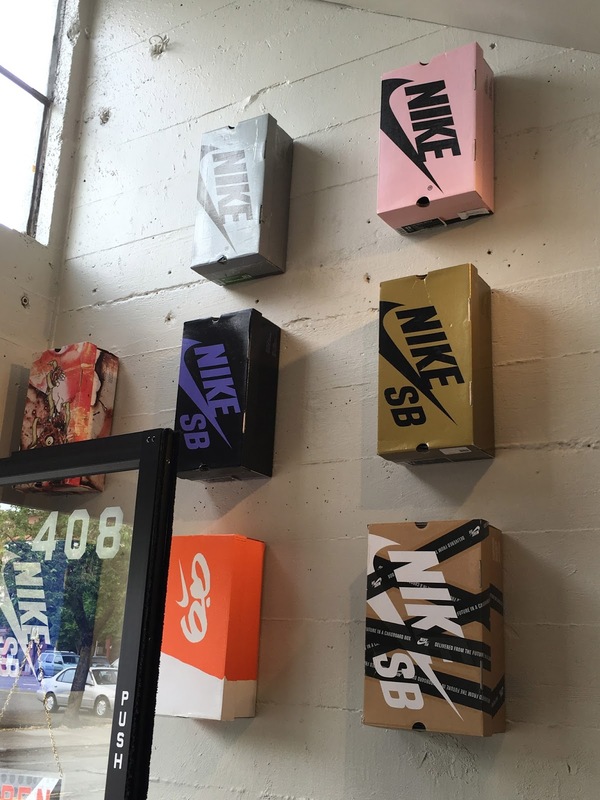 Deadstock was started by a former Nike employee who wanted a place to hang with fellow sneaker enthusiasts. Thus Deadstock was born. Located in a small storefront on NW Couch Street in the Old Town/Chinatown district of Portland, Deadstock crams a lot of personality into its small space. It is a shrine for sneaker heads and hoop fans. Classic kicks are on display as well as shoe boxes, basketball themed art and other great touches. It is fun and welcoming, without a wiff of coffee culture elitism that can pervade some shops. My favorite touch. Sorry Zo fans. What Nike fan shrine is complete without a tribute to the man who made the company. If you recognize some, or all, of these, this is the spot for you. Deadstock has my favorite sound system, bar none. Custom made by a friend of the owner who turns old suitcases into speakers. Sounds great and the chalkboard works. 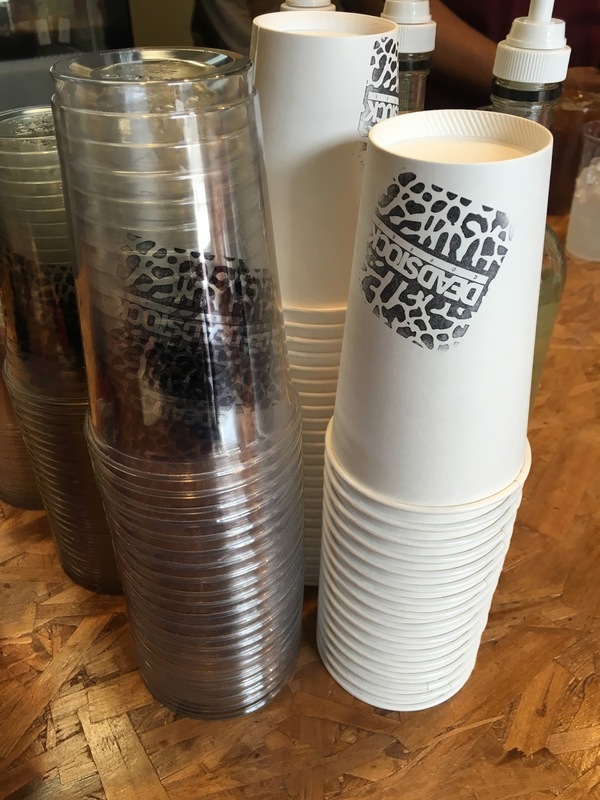 Just about every shop in Portland hand stamps their cups. Now there is no point in a coffee shop unless the coffee is good. Deadstock's is. Their beans are roasted for them by Dapper & Wise in Hillsboro, OR. No surprise, the packaging is dope. My personal coffee shop test is the cortado. They make a great cortado. They do cold brew and are proud of their tea. The owner has also created his own mix of lemonade and cold brew which he calls a LeBron Palmer. Yeah. Coffee, LeBron, sneakers and hoops. This is as far away from your coffee shop tropes as you can get. But wait, there's more. They offer sneaker cleaning services. They have a sneaker themed blog on their website. To be clear, I am not a sneaker fanatic, and I am a lukewarm basketball fan. That did not stop me from loving this shop and its infectious personality. Hopefully it will inspire a new wave of personal, and personality driven shops. And the coffee is really good. Summer is finally giving way to fall, but the desire to be outside remains strong. Trips to the beach and backyard barbeques give way to apple picking and leaf peeping. We all know winter is just around the corner, so the desire to eek out a few more fun filled days outdoors is strong. One of the best excursions I can recommenced is a wine tasting tour of the North Fork of Long Island. The North Fork is home to more than forty vineyards, producing everything from Chardonnay to Cabernat Franc and Sparkling Wine. Almost all of the vineyards have tasting rooms and on the weekends a number of them feature music and food along with their wine tasting. There are some really nice wines being made on Long Island. The following are a few favorites, some well known, some out of the way. Use them as a trusty starting guide then feel free to experience others. The worst thing that will happen is that you have some okay wine with friends in a beautiful setting. In addition to the vineyards, you will find fantastic farm stands brimming with local produce, good restaurants and some of the prettiest countryside you will see. If you have spent any time on the South Fork and wondered what East Hampton or South Hampton looked like before the mansions, money and celebrities rolled in, the North Fork will give you a sense. It will send you back in time. It has that kind of magic. Shinn Estate Vineyards, one of the most well known and well regarded of the North Fork Vineyards, was started By Barbara Shinn and David Page in 1998. The couple had found success in New York City with their restaurant Home when they decided to buy twenty acres and an historic homestead in Mattituck. Not content to just try their hand at making wine, they wanted to use sustainable farming practices to do it. Today the vineyard is certified sustainable and is completely powered by solar and wind. But make no mistake, the wine making comes first. Shinn Estate has a lovely patio and tasting room. Tastings are available by the glass or in flights. Small snacks, like a nice cheese plate, are available as well. In addition to their wines, Shinn makes an eau de vie, alembic brandy, grappa and grape vodka. Shinn Estate 2013 Coalescence, 2013 Rose & 2010 Cabernet Franc. This was not taken at the Vineyard. In addition to the vineyard and distillery, Barbara and David run The Farmhouse, an Inn on the grounds of the vineyard in the historic homestead. If all this is not enough to entice you there is one more thing. Shinn Estate Vineyards sits at one end of Oregon Road, perhaps the loveliest stretch on the North Fork, which runs past farms, vineyards, old houses and some of the last potato trucks on the East End. You will be hard pressed not to find the beauty of the North Fork here. The Old Field is aptly named. It sits on land that was farmed for hundreds of years by Native Americans before European settlers bartered for it in 1640. The Baiz family has been farming the land since 1918. In 1974 Christian Baiz, the fourth generation to farm the land, decided to plant the first grapevines and transition the land into vineyards. Today The Old Field produces ten wines, all available to taste at the vineyard. This is a family affair, with the fifth generation joining their parents in running the vineyard. This family dynamic makes The Old Field one of the most welcoming vineyards you will ever visit. The setting of The Old Field feels more like a family friendly farm than serious vineyard. The grounds are dotted with picnic tables that play host to big family gatherings. Small children run around, playing games and chasing the chickens that call the vineyard home. The tasting room is in one of the several picturesque old barns. It is as comfortable and bucolic a setting for tasting some wine that you will find. Tastings are done by flight. Each person can choose the wines in their flight so if you come with a few people and you are willing to share you can taste all the wines The Old Field has on offer. My favorites are the 2010 Cabernet Franc, The 2011 Chardonnay and the 2007 Blanc De Noir, a sparkling wine made with the Pinot Noir grape. Ask about the history of these cages in the tasting barn. Sip some wine, meander down the farm road and take in land that has been cultivated since before Columbus completely missed the East Coast. These are the pleasures of The Old Field. The one woman in question is Claudia Purita, a native of Calabria, Italy and a veteran of Long Island Kitchens. She started tending 16 acres of land in 2004 and her first vintage was 2007. The operation is small, with just a few hands helping Ms. Purita. The tasting room is the size of a chicken coop. A few picnic tables sit out front. One Woman's size allows Ms. Purita to be as hands on as possible and to focus on her wines. The proof is in the glass. One Woman produces, Sauvignon Blanc, Chardonnay and Merlot, but the reasons I keep coming back are her two wines with Austrian roots, Gruner Veltliner and Gewurztraminer. 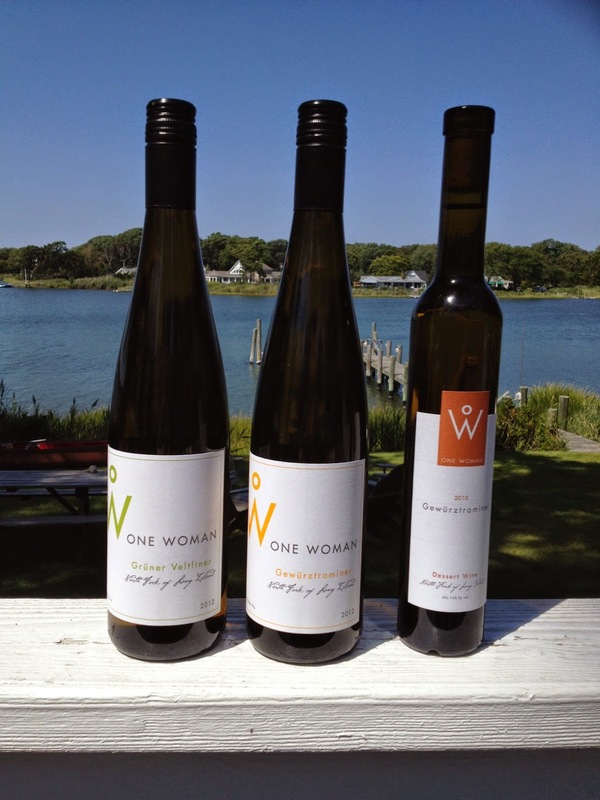 One Woman is the only producer of Gruner Veltliner on Long Island and one of the few making Gewurztraminer. She has two vintages of each, the younger 2013s, which are light and drinkable, and the 2012s, which have more depth and character and are excellent. The Gewurztraminers are crisp with floral and herbal notes. The Gruner Veltliners are dry with tastes of fruit and citrus. In fact, they are my two favorite whites from the North Fork. If you are unfamiliar with these grapes One Woman's wines are an perfect place to start. They would be welcomed in any restaurant in Austria and Germany. For proof I give you my mother, a native of Germany, who visited One Woman with me and walked out with half a case. Mom knows best. One Woman 2012 Grüner Veltliner, 2012 Gewürztraminer, Dessert Wine. Again, photo not taken at the vineyard. One Woman also makes a delicious dessert wine from their Gewurztraminer grapes. Definitely try it while you are there. Tastings are by the glass or in flights. There is a standard flight and a reserve flight. In a nice touch, and one more vineyards should offer, tastings are free with the purchase of two or more bottles of wine. You will buy at least two bottles, I promise. One Woman also hosts tastings "Under the Stars" on Saturday Nights from Memorial Day to Columbus, with a free family friendly movie, bonfires and s'mores. One Woman is more proof that good things come in small packages (or parcels). 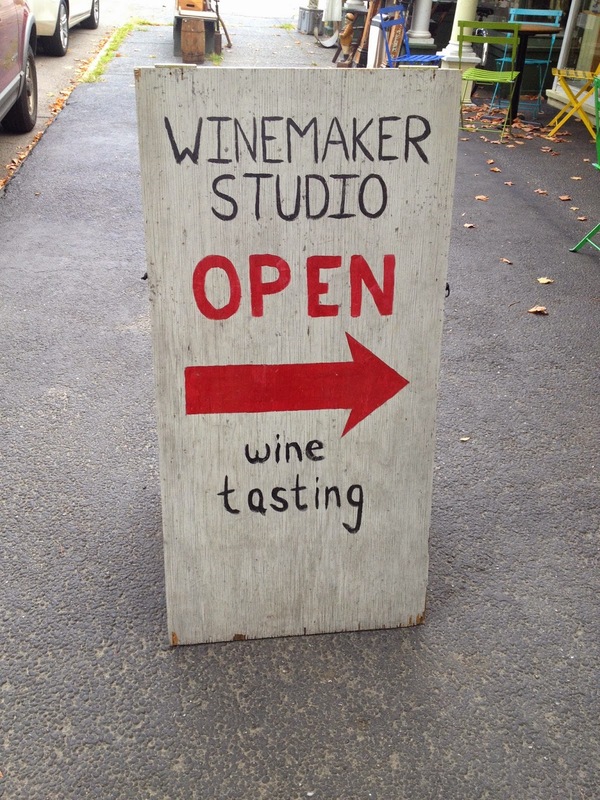 Tucked in an old house on a small lane in Peconic is The Winemaker Studio. The Winemaker Studio is a cooperative tasting room started by Anthony Nappa, the winemaker for Raphael Vinetards. The studio focuses on private label wines by local winemakers. Mr. Nappa's Anthony Nappa Wines are featured but wines by other local winemakers like Russell Hearn of Lieb Cellars, John Leo of Clovis Point and Erik Bilka of Castello di Borghese are represented as well. . The Winemaker Studio gives you the chance to experience personal expression from some of the top local winemakers in a single, cozy setting. What's not to like? In addition to the private label wines The Winemaker Studio also focuses on local, small production wines and unusual wine styles. It even offers a few local spirits and beers. If you are a wine geek, The Winemaker Studio is for you. Mr Nappa and his wife Sarah, a chef, recently opened Provisions & Ingredients in the adjoining building. The store is stocked with gourmet food from New York and Italy and offers a small menu of tapas, plates and pressed sandwiches that are can be eaten in The Winemakers Studio. This is one stop shopping and the perfect place to relax for an hour with friends. A man's gotta eat, especially if that man (or woman) keeps tasting wine. There are a lot of good spots on the North Fork but, if you are like me, and you are this close to the water, you want seafood. Luckily for you, Southold has one of the best seafood spots around. Formerly housed in the Port Of Egypt marina, Southold Fish Market, which has relocated to new digs just down the street, is a seafood store and restaurant in one. The market features fresh, locally caught fish and shellfish. If you are spending time in the neighborhood and are planning on grilling, this is your place. If you are just spending the day, or a weekend, this is also your place. The restaurant features all that great seafood on their vast menu. All the fried seafood staples, like fish and chips and fried clams are available as well as healthier but no less tasty items like grilled tuna sandwiches and fish tacos. An appetizer of crab bites, fried mini crab cake balls with a house made remoulade are not to be missed. If you are a lobster roll fan, Southold Fish Market's over sized roll, stuffed with lobster meat, is a must. Did I mention the bacon wrapped scallop quesadilla? Daily specials are available, based on what is fresh and what creative spark comes to mind in the kitchen. In a nut shell, they know their way around seafood. Southold Fish Market is the summer fish shack we all wish we lived near, but with even higher aspirations. It will not disappoint. I have just scratched the surface of the joys that can be found on the North Fork. For beer fans, Greenport Harbor Brewing Company has two tasting rooms. 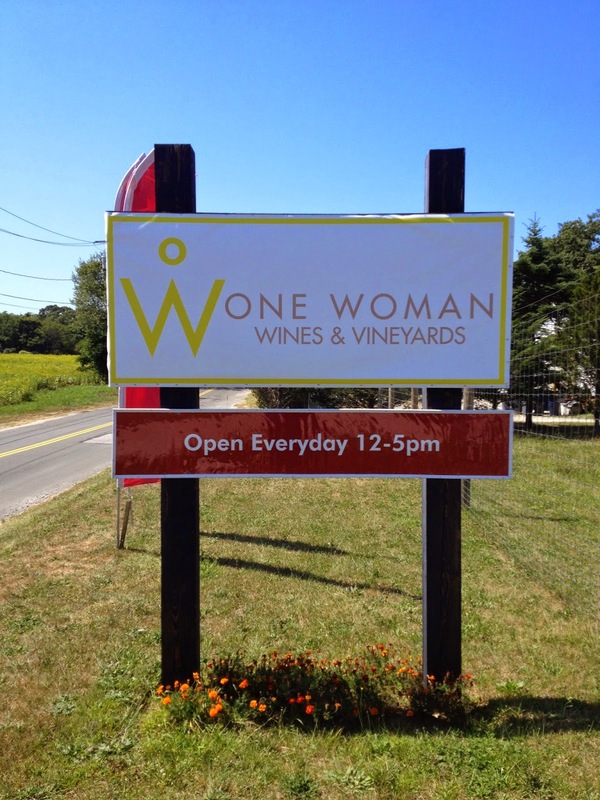 The original nestled in the heart of beautiful Greenport and their new, larger brewery, is conveniently located right on Route 25 in Southold, right in the heart of the wine trail. So go and discover the bounty the North Fork has to offer. You will be hooked quicker than a hungry bluefish.